I enjoy reading true crime, as long as it isn't serial killers or murder related. The books in this mini theme all center on art theft, or finding stolen art. This is a crime that happens all the time, with many of the pieces of art never being recovered. Part of the fascination for me with this, as well as other true crime I've read, is to try to figure out why a thief would choose this particular avenue for wealth. In the case of stealing artwork, it's a quandry, because the more well-known the art or artist has been, the more the piece is worth. On the flip side, the fame makes it extremely hard to resell down the line, unless the thief has connections with a private collector or something. The teen and middle grade fiction books give a more light-hearted perspective to the whole thing. 4 stars: Packed with interesting stories. 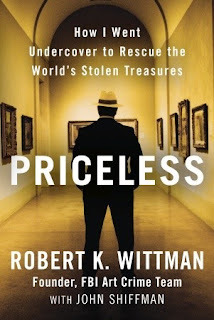 Wittman founded the FBI's Art Crime team during his tenure there. In our country, stolen art is not nearly as big a deal to the general public as in, say, Italy or France. So it took some doing for Wittman to make this the focus of his FBI career. Though he battled apathy and bureaucracy, he was able to recover some amazing pieces of art. Some of what he found and returned to their rightful owners were actual big-name paintings. All were important to history, like a battle flag from one of the few African American regiments in the Civil War, and an original copy of the Bill of Rights. Wittman found he had a knack for befriending the bad guys and getting them to deliver up the goods. Along the way, it also becomes a memoir of sorts, as he talks about his growing up years, a tragic accident that affected his life for years, and his marriage and family. He tells of the successes, but also the times things went wrong--or nearly so. Through the years, he worked with agents from all over the world to recover missing art and artifacts. I enjoyed this insider's look at the world of art crime and investigation. I couldn't believe a) how expensive some of this art is and b) how poorly guarded. Also, how easy to get these stolen items across borders. Once lost this way, it's anyone's guess who might end up with it--often mafia or mobsters of various stripes--who use the art for a type of currency. Wittman came very close to recovering the artwork stolen from the Isabella Gardner Museum in Boston, but you'll have to read it to find out what happened. 3.5 stars: An entertaining read. Tells the story of the theft of Edward Munch's The Scream, from a prominent museum in Norway, right during the Olympic games held in Lillehammer. The Norwegians were deeply embarrassed and rather desperate to get their masterpiece back. Meanwhile, over in London, undercover policeman Charley Hill heard the news and decided he could find it. 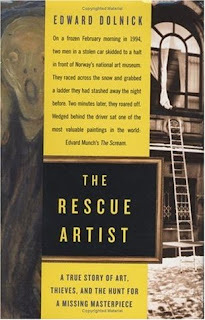 Details the story of the search and recovery, but it also delves into Charley Hill himself, as well as Edward Munch, art history in general, and museum security (or lack thereof). Whereas Priceless spanned a career, The Rescue Artist focused in on this one rescue mission. Charley's unique blend of belligerence, acting skills, and knowledge served him very well on this case. I found the side trails interesting enough, as well. I have never really liked the work of Edward Munch, but I was interested to learn more about him. He had some stuff going on, let me tell you. Most of it mental health related. Did you know he wasn't even well-known in his own time? 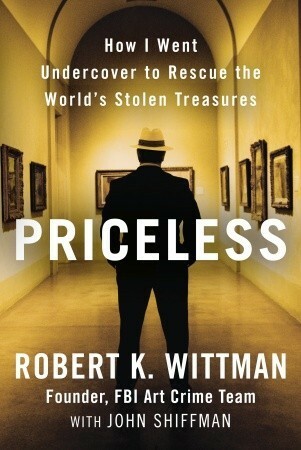 Of the two, I liked Priceless, by Robert K. Wittman better. Content: Quite a bit of bad language. So Moxie has a best friend named Ollie, and the two of them have an awesome summer planned out. Then a mysterious and mean redhead shows up at Moxie's door demanding things that Moxie doesn't know anything about. She has a pretty good idea who hid the things, though: her Grandpa. He helped some big-time crooks hide stuff back in the day--though he's been out of that business since she was a baby. Moxie delves deeper into the mystery, and realizes that the missing items were stolen from the Isabella Stewart Gardner Museum and have never been recovered. Also, they are worth millions. Unfortunately, Grandpa is suffering from Alzheimer's and even if he weren't, is not at all likely to give up his hiding places or be okay with Moxie getting involved. However with redhead escalating the threats, both to her personally and to her family, Moxie feels that she has no other choice than to try to find the missing art herself. With Ollie's help. I liked that this was based on a real unsolved crime, and I thought the hiding places were clever and believable. Geared for teens or tweens. Maybe a step up to offer kids who are fans of Blue Balliet's middle grade mysteries. Theo's grandfather died recently, and with her mother locked in a world of her own, it's up to Theo to take care of them both and the house. 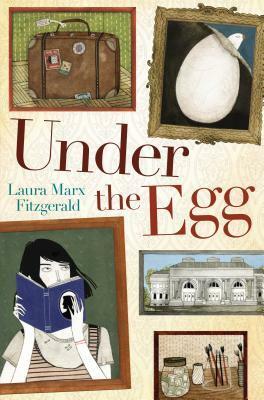 As he died, he told her to look "under the egg" for a letter and a treasure. Well, she's searched everywhere egg-related she can think of and hasn't found a thing. Then she spills some rubbing alcohol onto the painting of an egg that had always hung in her grandfather's art studio. (She had taken it down to look under it.) The paint started coming off, to reveal something else entirely underneath. A different painting. A really old painting. Could this be the treasure he was talking about? Except, if it's an authentic painting by one of the masters of the Renaissance, does that mean it's stolen? By her grandfather? Theo needs some help, and it's certain that her mother is not going to give it to her. She heads out into the city (NYC, that is), and ends up making some friends along the way to solving the mystery of the painting and the mystery of her grandfather's life. Somehow I seem to be reading on a theme without planning it: art heists and the surrounding mysteries. 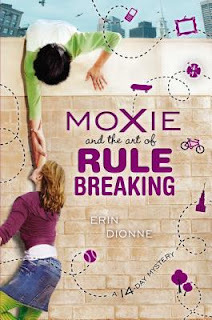 I liked this one better than Moxie and the Art of Rule-Breaking, primarily because it had more depth to the backstory. I won't say any more than that, because finding out why her grandfather had this painting is such a big part of the story.